Hofmann’s monty 1625 series tire changers are designed for high-volume tire shops, multi-bay repair shops and car dealerships. The monty 1625 series swing-arm tire changers feature 24" outer-wheel clamping standard (28" with optional adapters). These tire changers feature a four-jaw clamping chuck which is self-centering and clamps wheels with either a 26" inner or 24" outer diameter. Now available in a new two-speed configuration. 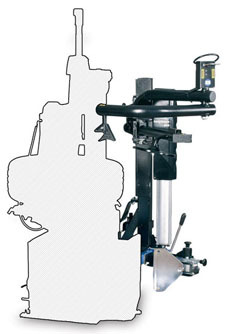 Overall Wheel Clamping Diameter 10" - 26"
Inner-Wheel Clamping Diameter 12" - 26"
Bead Breaker Range 2" - 18"
Allowing for a tire diameter of 50" on the monty 1625 (42" on the monty 1625em), and an outer-wheel diameter of 20", can handle wheel and tire assemblies found on cars and light trucks. Self-centering and clamps wheels with either 26" inner or 24" outer diameter. 6,000 lbs. of power at the bead shovel and a range of 18" wide. Bead Assist Device for Monty 1625 & 1625em Machines. EAA0329G36B - Standard with monty 1625em (M1625EM110), Optional with monty 1625 (EEWH748A & MONTY1625). M1625EM110 monty™ 1625EM w/"EasyMont Pro"